PENTAX TTL (Through-the-Lens) Loupes are the world’s first prismatic deflection loupes. PENTAX's unique deflection prisms allow the users to magnify the operation field while standing upright and facing forward. This allows the users to magnify the operation field without the need to bending their neck down or hunching forward. Unique optical design allows prismatic deflection, with a declination angle of 48 degrees. PENTAX's unique and sophisticated design provides a bright and wide field of view. 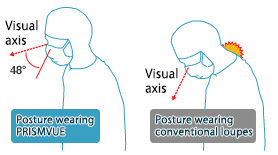 The upright posture facing forward during operation prevents the user’s head from interfering with the surgical lights and ensures a bright field of view at all times. Field width: The field of view is larger by 20 to 30% than that obtained with conventional products. High-refractive-index aspherical eyeglass lenses are incorporated. Wide field of view with aspect ratio of 5:6 reduces eye fatigue in binocular vision. Actual-size view can easily be obtained by just rotating the eyeballs downward. There is no need to detach the loupes or flip-up them by hand. The convergence (*Note) provided by the optical system allows stress-free parallel viewing at all times. This reduces the eye fatigue and cervical strain. Focus can be adjusted by turning the objective lenses which can be locked to keep the focus. The loupes can be secured using the straps with the stopper. ※Weight may vary dependent on the degree of the eyeglass lenses.